I already have more teacups (and teapots) than is necessary for any well-adjusted 24-year-old woman, but I just can’t stop myself when I see something that would enhance the drinking ritual. 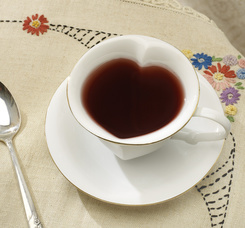 From Bits and Pieces: Heart-shaped teacup and saucer! Only (OK, only?) $12.99, or two or more for $9.99 each! Ooh la la!